So I am wondering about this blade.. Found it at auction locally and curious about it.. Love the style of blade And I'm looking for reasons not to buy it..
Also the lines that are showing up on the shinogi ji were not visible to the naked eye but showed up in the pictures they sent. I'm thinking it has something to do with the lighting in the ceiling of where they took the pictures? I don't think anyone can tell you much from the images you have supplied. 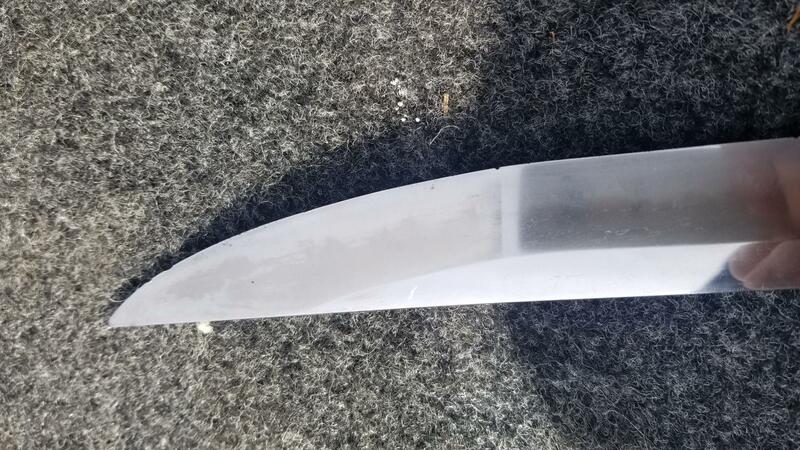 First and foremost you need to post a picture of the whole blade with some dimensions. Personally I cannot see any detail of hada or hamon either so all there is to go on are some partial images. The photos are still poor but the blade looks well made and in decent condition. If the price is low I would go for it. Sorry about the pics.. Thats the best I could get sent to me. Good ole gamblin..
Hi Nick the blade pics are too blury but its also too reflective. If you try it in a dark room with a torch and play around with different angles and distances you will be surprised how much detail you get and it can be quit enjoyable to see blades in this way. Good luck. Hi Nick. 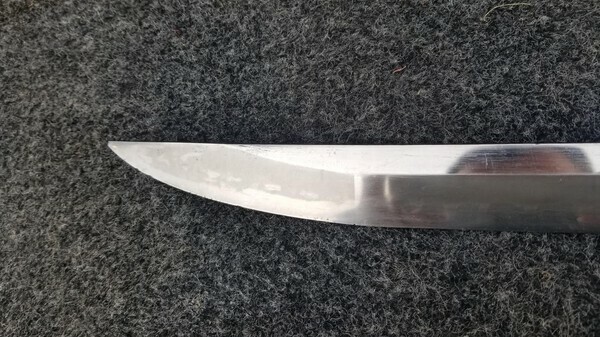 i like the shape, though I am a sucker for an okissaki blade. The nakago makes it look late to me, and I doubt that it is shortened from a longer and older blade. 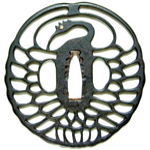 If the nakago is original, and the blade has not been shortened, then it may be shinshinto. The striation lines in the shinogi ji look to me like somebody has put it on a buffing wheel. This would also explain why it is so shiny in the photos. That is not intrinsically a horrible thing as long as there wasn't heat in the process causing loss of the yakiba/hamon in certain places and as long as the wheel wasn't left too long on the shinogi line and ground it to roundness or diminished its height greatly. In either of those cases, the polisher will have to reshape the blade and remove meat, both things to be avoided if possible. It looks in some photos like the hamon is dark and the ji is light. This is another common sign that somebody has put a blade on a polishing wheel. Again, as long as it wasn't destructive, a polisher can bring such a blade back. When a buffing wheel is used, the hada can become indistinct, so the blade might even appear to be mujihada, even if you got good photos, making it hard to judge whether it conforms to a koto school in case you decide that it might be koto. Bottom line, I doubt that it is a koto blade based on the nakago (although it could be one that was cut down in the last century or so). 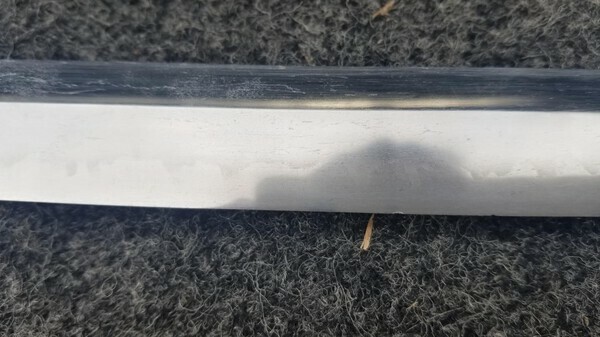 I wouldn't pay too much for it if you are uncertain about its age, since a mumei shinshinto blade in this condition is not worth a lot, and is almost certainly not worthy of the cost of restoration. Just my two bits based on the small amount of info from these photos. Let us know how it works out. 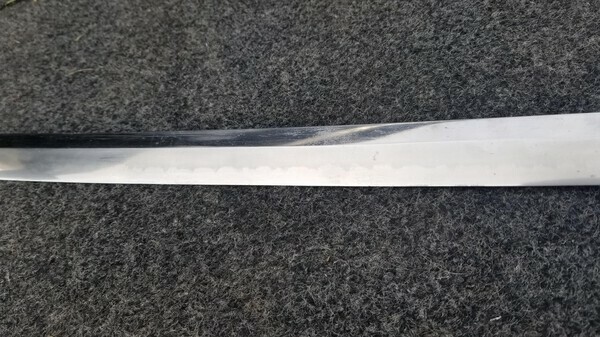 Looks like shinshinto sword but pics are too blury.can faintly see either a gunome or choji hamon. Thanks for the info Robert. Would it be possible that the lines on the shinogi hi (perhaps from wheel) would not be visible in person? I was able to see it tuesday and did not see them then but of course they are in some pics..
Also i think (though a novice) that it is suriage but of course wont know till I post some pics in hand and you guys tell me.. The reason I think/hope its suriage is the hamon definitely goes into the nakago on one side.. Cant see it on the other side.. Is it possible that the yakadashi is somewhere in the nakago while being ubu? The tang looks older in that pic Nick. (ha, picnic!). You asked about the two sides earlier and I replied - sometimes they heat a blade at the machi when they file it for machiokuri and it can diminish the hamon. I look forward to some better photos when you get it in hand. Best of luck. Nick, looking closely at the photos, the hamon doesn't really change shape going into the boshi, which indicates a Koto blade to me. I can't tell if the ana are chiseled or drilled, but I really don't think this is Shinshinto. What is the nagasa? but it takes a special kind of human to rise to life's challenges for a lifetime. If so think and heavy does this add to beeing probably Koto? There is really not much that can be said given the photos available. As far as I know hamon-boshi continuity is a rule of thumb for Shinto vs Koto. In Shinshinto we may see hamon-boshi continuity. Chisel/drilled holes don't mean much. If its shinshinto ubu mumei, then you need to add a chiseled hole to give it a koto vibe. I don't see any big discriminating evidence here in either direction. State of the Nakago, thickness and shape cues me towards Shinshinto, as well. I'm pretty confident that it's not a Nagatina Naoshi reshaped with a new yokote. I also think it's not ubu, because of the way the hamon flows off the hamachi. However this could just be a hadori job, I can't tell with the images. All together, it looks like a Nambokucho shinshinto revival utsushi with O-kissaki, dressed up as Koto with signature erased and suriage, nakago stuck in the ground to give it some old feel and and added mekugi-ana. Could be wrong. Better pictures are needed if we are to move beyond conjectures. 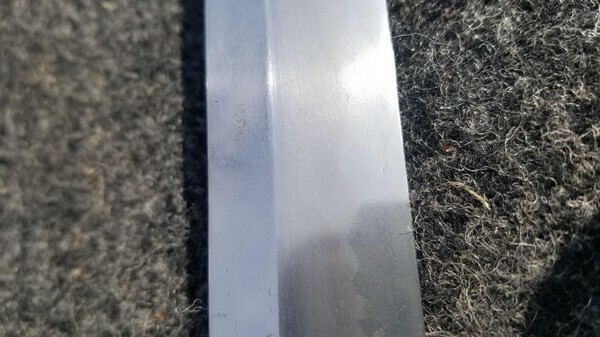 I think Chris could be right about this being utsushi as its unlikely to be koto if its still that thick isnt it most likely not koto as usually blades from that long ago have had many polishes and would have lost thickness? Just a thought.